A landmark of luxury and a tradition of expertly curated service come together at JW Marriott Miami Turnberry Resort & Spa. Elegantly designed, our spacious rooms and suites provide relaxing comfort with, marble bathrooms and private balconies overlooking the resort's tropical grounds. Our resort features BOURBON Steak by Michael Mina, serving signature cuts of prime meat, local seafood and a fine selection of over 1,000 wines. For casual fare choose from CORSAIR kitchen & bar, Surf House Bar & Grill or Freestyle offering all-day dining. Let your little ones join in days of fun at Tidal Cove Waterpark while you lounge poolside in a private luxury cabana. Golf enthusiasts can vie for under par scores at our two 18-hole championship courses, while our newly renovated full-service spa is a tranquil haven for beauty and wellness. The Turnberry resort shuttle provides a short ride across the street to the world-renowned Aventura Mall and beach access. Transform intense anticipation into reality. 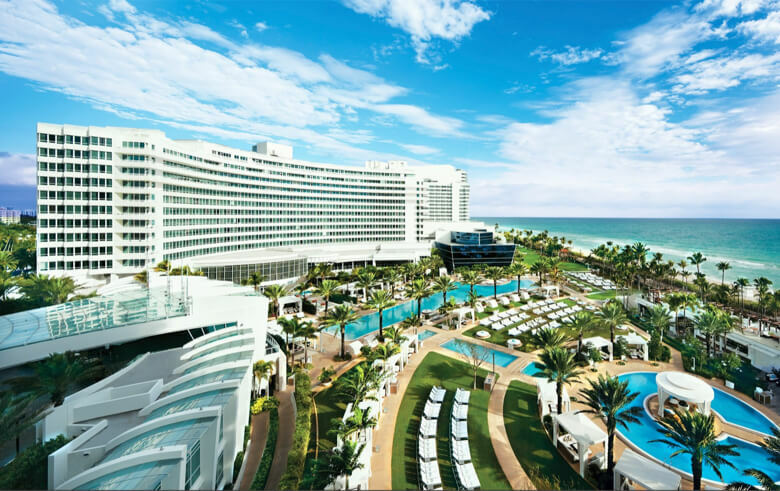 Fontainebleau Miami Beach introduces a new culture. One that blurs the line between the glamour of the past, the luxury of the present and a new vision for tomorrow. Defined by inspiration, expression and engagement it is a new culture in which anticipation exists from first awareness to long after departure. Participation allows guests to tailor experiences to their own desires. Technology encourages guests to share unique memories and create a perpetual experience. Emerging from the original vision of legendary architect Morris Lapidus whose daring designs epitomized a concept of setting a stage where everyone who enters will play their part. Fontainebleau combines striking design, contemporary art, music, fashion and technology into a vibrant new kind of immersive guest experience. Located just steps from Aventura Mall, near shopping, dining, entertainment and beaches; our extended-stay and pet-friendly hotel offers spacious studio, one and two bedroom suites, each with fully-equipped kitchens with separate living and dining areas and 4 meeting rooms with capacity for up to 120 people. Hotel amenities include free hot breakfast buffet, Wi-Fi, business and fitness center, outdoor swimming pool and 24/7 Market. Spacious accommodations, excellent customer service and just steps away from shopping, dining and entertainment. Hotel amenities include free Wi-Fi, Outdoor Pool, Bike Rental station, Grilling area and more! Restaurant on property, The Bistro, opens for breakfast, lunch, dinner & Happy Hour providing room service. Make room for a little fun at the Courtyard Miami Aventura Mall. Book your next stay in South Florida at this centrally located, award-winning hotel situated in Hallandale Beach between Miami and Fort Lauderdale areas and minutes from Aventura Mall. Our hotel offers newly renovated double and king rooms, each with mini-refrigerators, microwaves, flat-screen TVs, and free local calls.